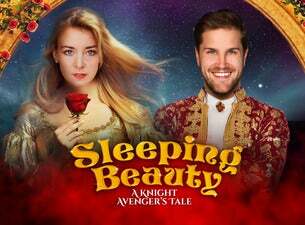 Awake from your enchanted slumber and be the first to book for our fun-for-all-the family fairy tale panto adventure, “Sleeping Beauty - A Knight Avenger’s Tale!" From the same creative team that brought you “ The Adventures of Peter Pan and Tinker Bell”, fall under the spell of Bonnie Lythgoe’s latest fairy tale classic. The maleficent Fairy Carabosse curses Princess Aurora to 100 years’ slumber, by a single prick of her finger on her 18th birthday. Doomed by fate, only a Prince’s sweet kiss can break the spell and awaken the sleeping beauty. Can Princess Aurora’s hilarious best friend Silly Billy and faithful Nanny Tickle help save the day and who will outwit the evil Carabosse and foil her wicked plans?